So, summer’s coming and you want to look good. But your recession-squeezed wallet is flinching at the high prices of healthy foods. Yes, it’s costly to buy the fresh fish and fancy fruits that many diets recommend. Fortunately, though, you don’t have to spend a lot to eat healthy. Here’s a list of the top ten healthy and cheap foods to try. Actually, most kinds of beans – black, pinto, garbanzo, lentil— are low in fat, and provide you with important fiber, folic acid, calcium, zinc and potassium. Dry beans take work to prepare; canned beans are a lot easier. Just make sure to rinse the beans well before using. Mix them in salads, soups or casseroles, or serve with rice. Eggs provide plenty of protein for not much money. Plus, there are so many ways to prepare them – scrambled, fried, sunny-side up, or hard-boiled for sandwiches and salads. Noodles go with everything. They’re a side dish, or good in a casserole or soup. The whole wheat ones are even better for you, although they do cost a bit more. An 18-ounce container or oats costs around $2.29 (on sale) and each container contains about 13 servings (if 1/2-cup of dry oats is a serving). Oatmeal is filling, has plenty of fiber and you can also make your own granola and muffins with it. Frozen vegetables come in 12-ounce to 24-ounce bags that cost anywhere from $1.75 to $2.25 and contain 6-8 cups, depending on the vegetable and the size of the bag. I like them because they keep a long time, don’t need any chopping, and cook quickly in the microwave. Potatoes are great whether you have them mashed, boiled, or baked. Just avoid the fattening toppings; stick to a little butter or margarine, or pile them with broccoli and melt some low-fat cheese on top. Tuna is healthy for you, filled with protein, and it’s so quick and convenient, too. Use it in salads, casseroles, or just plain. 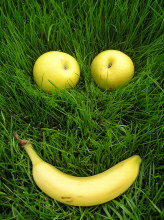 Bananas are an easily portable source of fiber, potassium and vitamin B6. Eat them plain, slice them into cereal, or blend them into healthy shakes. Apples are full of fiber and make a great snack anytime. Dense nutrition with and good for you. Milk is rich in protein, vitamins A and D, potassium, and niacin, and is one of the easiest ways to get bone-strengthening calcium. Very informative list. Fruits and vegetables make very good snacks in between healthy, thought out, nutritious meals. I have to add foods these to my Costco grocery list. Love Costco for their ultra cheap eggs and bananas.